When it comes to things to do in Enid, Oklahoma, I am always looking for new activities for my daughters. We love Creative Arts, and my daughters recently got the chance to participate in a pottery class. This class lasted for four weeks, and you went in once a week. They loved every second of it! My daughters are age eight and thirteen. This class was perfect for my older daughter, but the younger one needed a bit of help. She still had a blast with it! In this class, you will learn the basics of hand-building (pinch, coil, and slab construction), pottery tools and styles, Step-by-step instruction and glazes & firing. The first class we basically just learned how to do the basics with pottery, and they made their first piece. Every week they got to work on a new project, and they even got a chance to do some free time and just make things that they wanted to make. The instructor actually got the pottery all ready for us and on the last class they got the chance to glaze their pottery. I never had any idea how many coats it takes to make it look great, but we learned quickly! In the pictures, you can see a couple of things that my daughters made in their pottery class. 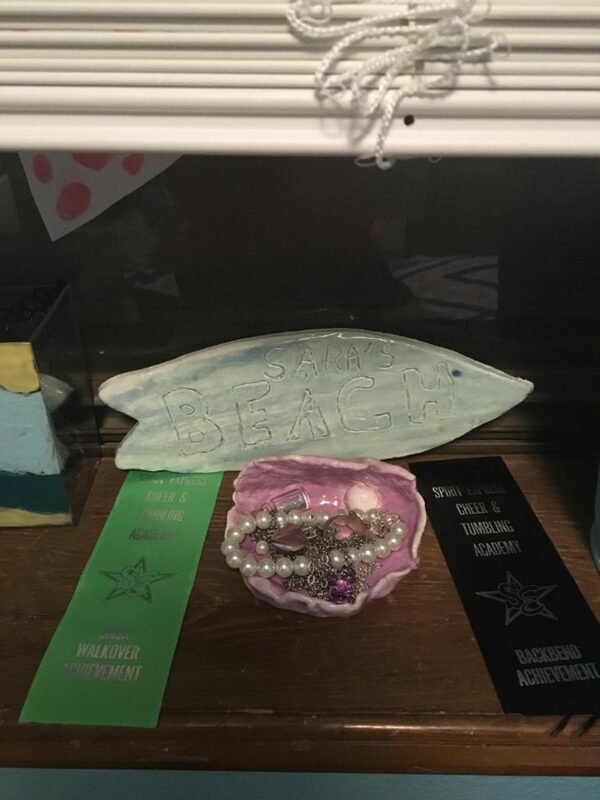 My younger daughter made the beach sign and the shell with a pearl in it to match her room theme. 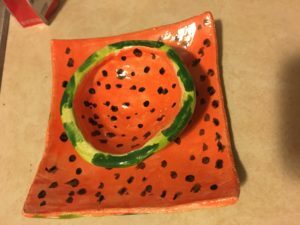 My older daughter made the plate and bowl then painted them to look like watermelon. I would highly recommend the pottery class at Creative Arts in Enid. The girls had a blast with it, and we may have to do this one again when we have more free time! You can check out their classes on the Creative Arts website and get signed up! Disclaimer: We received free classes in exchange for my review, but the opinions here are my own. ‘Dancing With the Stars’ Season 24 Big Cast Announcement: Who is Dancing In 2017?